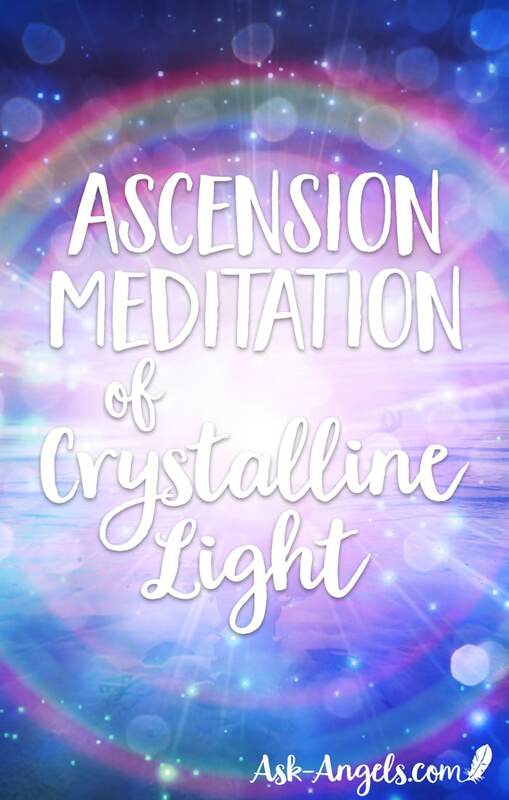 Relax and listen to experience an incredible Ascension Meditation and Solar Crystalline Light Transmission now. This meditation will assist you in releasing old energy and stepping into your power as an ascended being and awakened Pillar of Light. Realigning with the light of the Crystalline and Christ Consciousness Grids, illuminating your entire being with peace, harmony, love presence, and infinite light. The Ascension Meditation Music is from Thaddeus, the guided meditation channeled by Melanie Beckler. Or keep scrolling down to read the transcription of this Ascension Meditation. 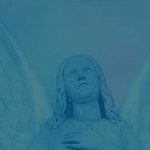 Greetings from Archangel Sandalphon, Archangel Metatron and Archangel Christiel – We greet to you on the vertical plane of awakened Christ light consciousness. So that you may fully receive this influx of solar crystalline light, let yourself now breathe, get comfortable, relax, and let go. Let yourself release whatever has happened leading up until this moment now, and release whatever is on your to-do list or task list later this day. Let go of the ties, just for right now, to the collective consciousness, to your family or ancestral line and to any and all expectations you may have for this ascension meditation experience. Let go and allow your awareness to enter inward, as from above, a great golden light shines down upon you. Archangel Christiel is receiving and broadcasting direct Source Light in your direction from above. Become aware of this pillar of Source Light presence all around you and become aware of the light streaming into your present point in time from above… This light serves in lifting your vibration, easing any tensions, fears or doubts, and releasing insecurities into the light, so that you in this moment now, can become aware of this Source Light presence. So that you in this moment now, can become this Source Light presence. 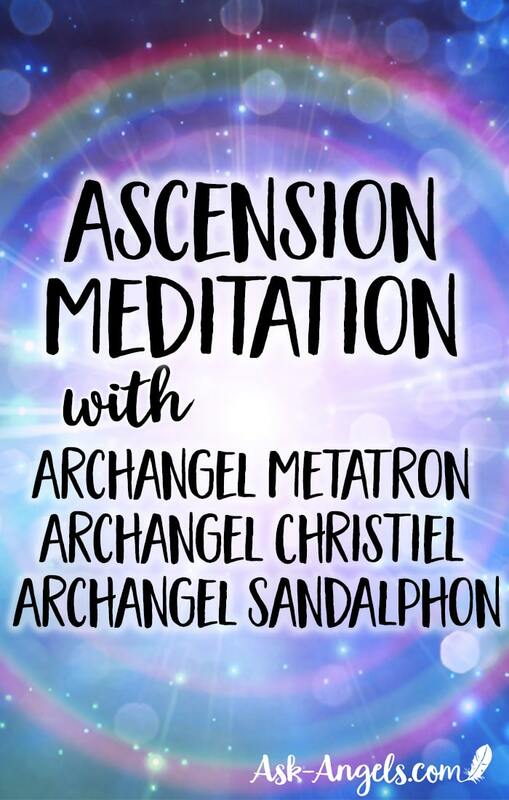 Now from below, Archangel Sandalphon assists you in receiving and connecting directly with the ascension light of the crystalline grid. Feel into and experience your awareness now centered in the crystalline awakened core of the earth. And again, feel your oneness with the crystalline grid and with all that is. Receive the healing, the rebalancing, the harmonizing of your mind, body, spirit and energy field that is available to you here and now. And now, visualize, imagine or simply feel that this pure crystalline light flows upward. The light and consciousness of the crystalline grid moves upward through your earth star chakra below your feet, up and in through the bottom of your feet and up along your ankles, calves, knees, thighs, hips, abdomen, back, chest, arms, hands, wrists, up through your throat, your jaw, your ears, your nose, your mind, your brain, and into your entire head. Your entire being is realigned and tuned into the light of the awakened crystalline grid now. The crystalline grid which is one with the higher dimensional consciousness of Gaia, which is conscious, and which receives and conveys direct from source and light, the new codes and frequencies, upgrades and healing energies available now through your tuning into the crystalline grid in this way, through your open heart center. You may now envision a stream of light that is the looping around your heart center and looping into the crystalline grid. An infinity symbol linking you up with what is truly the infinite supply of crystalline light already accessible within the higher dimensional expression of the new earth. Receive now from the crystalline grid, the downloads of love and light, the light packets of awareness, the capsules of peace and healing and wisdom available to you now. And as you now receive the downloads of light from the crystalline grid, let your awareness expand out through your heart center to become aware of your awareness spanning the entire earth. Become aware of a golden crystalline light grid around the planet anchored in sacred site locations, anchored in high energy vortex points, anchored in the physical, through you stepping into your true and authentic power as a crystalline pillar of light. Become aware once again of the column or pillar of light all around you which is concentrated in frequency and vibrancy along your core, so that your spinal column is absolutely glowing, shimmering, radiating light. This light expands out around you, so that your entire physical form is illuminated, every cell of your physical body is lifted up in this crystalline light, bringing the template of perfect crystalline coherence and harmony to your every cell, attuning your physical, emotional, mental, energetic vibration with the crystalline geometries of peace, harmony, love, balance, divine presence and infinite light. And so, being aware of the column of source light around you, held in place and assisted by Archangel Christiel and becoming aware of the crystalline grid that you are connected with through your heart center, assisted by Archangel Sandalphon and now, from above, become aware of the golden Christ consciousness grid lowering down, assisted by Archangel Metatron. The Christ consciousness grid lowering down from oneness with the infinite, oneness with all that is, down through your divine gateway chakra, your stellar gateway chakra, your galactic chakra, your soul star, your crown, into your physical body, uniting with the pillar of light along the central column of your crystalline form. The Christ consciousness grid now aligns with your physical, mental, emotional, spiritual form, bringing you the downloads, the influx of light, the surge of awakening, the expanded level of awareness, the realignment with crystalline Christ, golden, solar, vibrant love. This Christ consciousness grid connected to the infinite lowers down through your physical form, down through all of your energy centers, down along the pillar of light around you, anchoring into the crystalline core of Gaia, mother earth and rising back up, clearing, purifying, divinitizing and realigning now, the level of your heart center, expanding out infinitely on both the vertical and horizontal and diagonal planes. Let yourself be illuminated with Crystalline Christ level awareness which is received, integrated, embodied through your awakened heart center which receives a powerful cleanse and purification, a powerful realignment with the infinite levels of divine love. Become aware of the light glowing within your heart, vibrant, shimmering, shining, powerful. And now, become aware that the glow of this heart light extends out far beyond you, connecting you with the crystalline grid, connecting you with the Christ consciousness grid, and connecting you with the infinite, across the lines of time, across time and space, connecting you with Divine Source Light, I Am level consciousness. We assist you in lifting up, expanding up into the infinite, and expanding down into the light at the crystalline core. 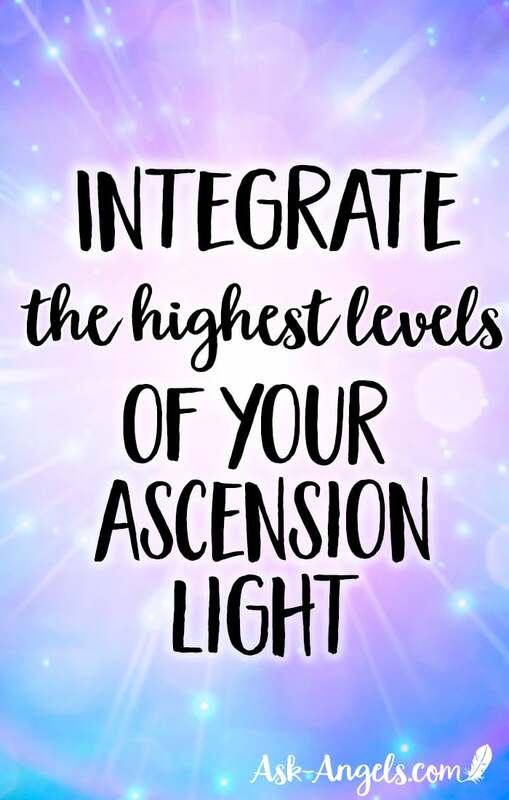 Integrating the highest levels of your vertical light, so that your pillar of ascension light, Christ level consciousness is renewed, uplifted, raised in vibration, and is divinely and energetically fueled. 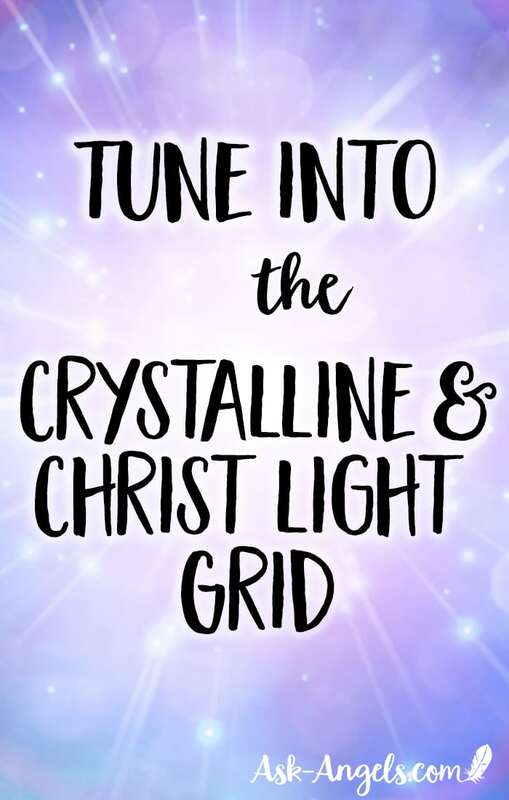 Your Christ level, crystalline level, source level awareness restored and with this, the divine template and blueprint for your diamond light, crystalline light body reinstated and realigned with you in the physical. This expansion along the vertical plane empowers you to expand and shine your light forth, elevating and expanding your awareness in every direction, in every dimension, becoming aware of your divine multidimensionality and truly glimpsing and tasting and seeing and feeling and knowing and experiencing the beauty of your divinity which you anchor through returning awareness to your awakened heart center and consciously choosing in the moment to embody the crystalline Christ consciousness through choosing the path of love, of joy, of laughter, light, of being of service. For through this, you are truly able to expand and to embody all that you are, both vertically, horizontally and in every dimension and direction of time, space and beyond. For the vast grid of crystalline light, and the vast divine geometry of creation is not separate from you. You are a part of it, one with it… Feel into this now. When you step into your power as an awakened crystalline pillar of light, through shining with this same radiance and beauty and power and light and bliss in every moment, in the present moment, you not only anchor the higher grids of energy, but you access the wisdom, light, power, gifts, love that is contained at this level and spectrum of crystalline Christ consciousness which is yours to experience and embody, to call forth and to create with. Create harmony and blessings across the lines of time in entirely new ways, in alignment with your highest light and inspiration through your connection with this innate level of wisdom, crystalline clarity and bliss. Let yourself simply relax more deeply, be and breathe to expand into the full level of awareness available to you now. Seeing and feeling and perceiving and sensing far beyond the level of your physical senses and capabilities, perceiving and receiving the light of the infinite through the lens and perspective of your highest divinity, embodying and shining with the full extent of your crystalline Christ consciousness, your most vibrant love, in oneness with Divine Source Light. And we, Christiel, Metatron, Sandalphon align in love to send you our blessing. Expand into this new level of Christ light awareness. Let it in. Let the Crystalline light illuminate you… Receive and shine the light and blessings out forth far beyond. Access another Ascension Meditation Technique here through Heart Awakening! Melanie you are just amazing. Your voice is so comforting and easy to trust in leading us into something somewhat unknown yet so beautiful that words will never be enough to describe it. I just finished your realigning with Christ consciousness meditation and all I can say is it was sooooo POWERFUL and the love and light is so overwhelmingly beautiful. I didn’t want it to stop!!!! Of all the feelings and emotions in my life that I’ve experienced, nothing can come close to the feeling of comfort, peace and most definitely love when connected with divine love and light. I’d gladly go as far as saying I never had a clue what love really was until I finally let go and let divine love and light fill my heart and soul! I’m so grateful for you and your messages! I’m blessed to have came acrossed your website. Hey Shown, Thank you for your kind words… I’m definitely not a guru, just another soul on the same path as you, sharing my connection with the angels… And luckily they have some incredible wisdom, light, and frequency to share. So beautiful and uplifting, a gift from above, words cannot fully describe and I am truly forever grateful. Yay so glad to hear you had a powerful experience with this! 🦋🌟💛 Love, gratitude and bright blessings your way! Thank you so much for this ascension meditation – I feel so good! Love To All! Thank you so much Melanie! It’s to calming, peace-filling, soothing! I feel truly “light up” with the angelic energy it contains! !